The two most common ways DUTs can be electrically damaged during test are from current-related events or voltage-related events that mange to over-stress the DUT. Sometimes the cause can be an issue with the DUT itself. Other times it can be an issue stemming from the test system. The most common voltage-related damage to a DUT is an over voltage event, beyond a maximum level the DUT can safely tolerate. While there are a number of things that can cause this, most invariably it was an issue with the test system power supply, either from inadvertently being set too high or from an internal failure. To protect against accidental over voltage damage, test system power supplies incorporate an over voltage protect (OVP) system that quickly shuts down the output upon detecting the voltage has gone above a preset threshold value. More details about OVP have been written about here in a previous posting “Overvoltage protection: some background and history”(click here to review). The critical thing about over voltage damage is, in most all cases, that it is virtually immediate once the voltage threshold where damage to the DUT occurs is exceeded. It is therefore imperative that you optimize the test set up and settings in order to provide effective protection of your DUT against over voltage damage during test. 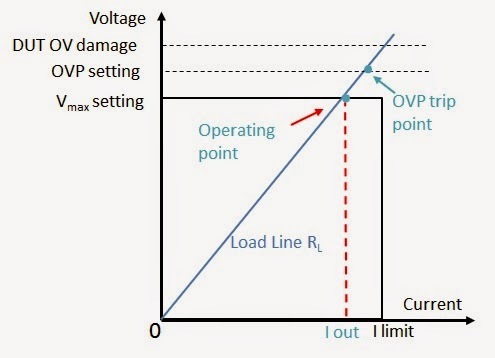 To start with, the OVP trip threshold needs to be set at a reasonable amount below the threshold where DUT damage occurs and at the same time be set to a reasonable amount above the maximum expected DUT operating voltage. This is depicted in Figure 1. However, to understand what are “reasonable amounts” above the maximum operating voltage and below the DUT damage voltage levels you need to take into account the dynamic response characteristics of the power supply output and OVP system, as depicted in Figure 2. It is important to have adequate margin above the maximum operating voltage to account for transient voltages due to the DUT drawing current from the power supply and resulting voltage response of the power supply in correcting for this loading, in order to prevent false OVP tripping. It is likewise important to adequate margin below the DUT damage threshold as it takes a small amount of time, in the range of 10’s to 100’s of microseconds, for the OVP system to start shutting down the power supply’s output once the OVP trip point has been crossed. At the same time the power supply typically has a maximum rate the output voltage can slew in. In practice these “reasonable amounts” typically need to be a few tenths to several tenths of a volt as a minimum. Generally these margins are not difficult to manage, except when the DUT’s operating voltage is very small or the DUT operating current is very large producing a correspondingly large voltage drop in the power supply wiring. This is because the OVP is traditionally sensed on power supply’s output power terminals, so that it provides protection regardless of what the status and condition of the remote voltage sense wiring connection is. To improve on this we also provide OVP sensing on the remote sensing wires as an alternative to, or in addition to, the traditional sensing on the output power terminals. More details about this are described in another posting here “Protect your DUT: Use sense leads for over voltage protection (OVP)”(click here to review). By following these suggestions you should be able to effectively protect your DUT against over voltage damage during test as well!